Significance – Denver loves a parade. Historically, parades and processions are held for a wide range of reasons, but in Denver, these spectacles are usually some kind of celebration. 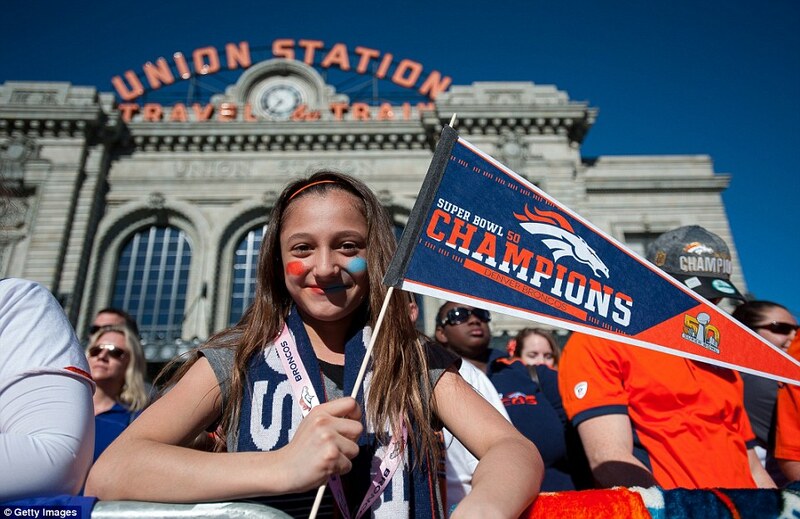 Details – Denver is a city that appreciates a good parade and they have them often. Seems like you can always gather together a willing procession of people with a theme and 17th Street has become one of the City’s favorite places to march. If you want to be part of the gathering, there are many annual parades to choose from. St. Patrick’s Day Parade – Denver’s earliest parade on record is St. Patrick’s Day, 1883. 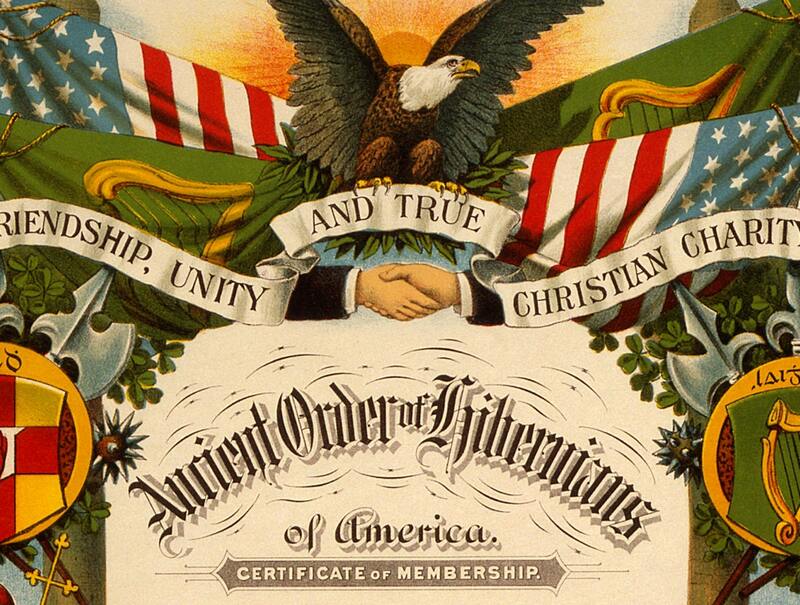 It was sponsored by what was then the largest Irish organization in the U.S. – the Ancient Order of Hibernians. 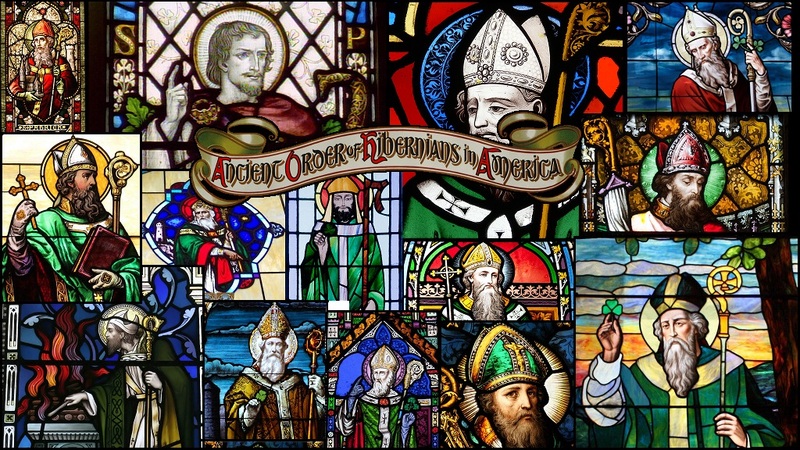 The parade commemorated Saint Patrick and the arrival of Christianity in Ireland, and Irish culture. The St. Patrick’s Day Parade began the next morning promptly at 9:15. In a grand procession down 17th Street were the neighborhood’s Irish represented by their social clubs; hundreds and hundreds of proud Irish adorned in their finest regalia. The parade finished near St Elisabeth’s Church, in time for all to attend high Mass. These beloved St. Patrick’s Day festivities continued through 1921. Security around Denver as well as its demeanor of the City changed after the 1922 Mint Robbery. The parade went underground, and did not re-emerge until 1962, inspired by a visit from the Lord Mayor of Dublin, Robert Briscoe. Legend has it, that upon the Lord Mayor’s arrival, he was driven in a motorcade to the Brown Palace Hotel where he met with business and industry leaders to promote Irish business and trade. After the meeting a large group piled into Duffy’s Shamrock Restaurant Bar on Court Street where they lamented the deceased parade that had once been the hallmark social event for Denver. After a few drinks, they decided to revive the parade. They pulled out a small American flag and marched around the block in a single line to the curiosity of happenstance bystanders. And, so, St. Patrick’s Day Parade and ball were reborn. Memorial Day Parade – Another of the parades annually honored on 17th Street is Memorial Day, a national holiday that started after the Civil War to honor of those who died in battle. Waterloo, N.Y., is considered to be the birthplace of the holiday. In 1865 an organization of Union veterans established Decoration Day as a time to place flowers on the graves of fallen Civil War soldiers. Three years, the U.S. Department of Veterans Affairs recognized Decoration Day at Arlington National Cemetery. This was the first large observance to honor those who died in battle. There were about 5,000 people in attendance at the 1968 gathering, including Gen. Ulysses S. Grant. Initially only honoring fallen soldiers in the Civil War, Memorial Day was expanded after World War I to honor all those who have died in American wars. Congress declared Memorial Day a national holiday in 1971. Veteran’s Day Parade – The next official 17th St. parade on the list is Veterans Day. Official recognized on November 11th, Veteran’s Day began as Armistice Day to celebrate the end of World War I. It is a day to honor American veterans — living and gone. Today, the Denver Veterans Day Parade and Festival celebrates and salutes our nation’s veterans, their commitment and sacrifice. If you like online battle games, this is the real-life version. The parade features military memorabilia, marchers in uniforms, custom Army and Navy vehicles and state-of-the-art weapons on display. Interestingly, it is regimented into various themes of military conflicts including the Revolutionary War, Civil War, World War I and World War II. Parade of Lights – Didja know Denver was the first spot in the world to feature outdoor Christmas lights? The tale dates back to the years of World War I – Christmas Eve 1914. Ten-year-old David Jonathan Sturgeon was in bed at his home at 4408 West 34th Avenue in Denver, too sick to go downstairs and join his family around the Christmas tree. His dad, Denver electrician David Dwight “D.D.” Sturgeon, wanted to cheer up his ailing son. He dipped clear light bulbs in red and green paint and strung them on electric lines over an evergreen tree outside David’s window to brighten his holiday. The effect pleased not only the boy, but also the entire city of Denver. The Denver Post carried the story, which became the first written record of electric outdoor Christmas lights. People came by horse-drawn carriages from miles away to see the brilliant, glowing tree. The next year, neighbors decorated their trees, too. Lights at the Denver Civic Center were replaced with colored globes of red and green for the holidays. The next year, there was an illuminated Christmas tree in front of the State Capitol. Denver was the spotlight of a new holiday tradition. D.D. Sturgeon was dubbed the “Father of Yule Lighting.” The country’s first outdoor-lighting contest was held in Denver in 1918, attracting hundreds of contestants. By the late 1920s, Denver had become known as the “Christmas Capital of the World.” Manufacturers produced affordable products that would work indoors and outdoors regardless of the weather. As a result, electric billboards across the country began to flash with colored globes, giving rise to flashing neon signs. In 1945, NBC broadcast a tribute to Denver and the Sturgeon family for having created a beautiful holiday tradition. The Parade of Lights honors this Denver legacy. It began in 1975, and today stretches more than two miles through downtown Denver. It features marching bands, ornate floats, Santa Claus and soooo many lights. It’s one of many light shows that brighten the skies over Denver during the holiday season. This Downtown Denver Grand Illumination lights downtown with more than 600,000 lights, all of which stay brightly lit every night through the end of the National Western Stock Show. The massive display includes Denver’s newly restored 1914 Beaux Arts Union Station, which is flooded with colored lights. Other downtown spectacles include the mile long 16th Street Mall, where every tree is decorated with thousands of LED bulbs, and Civic Center Park, where you can enjoy the brilliant lighting of the City & County Building. National Western Stock Show Parade – Denver relives its Cowtown days every January with the National Western Stock Show. With animals numbering close to 20,000 it’s the largest stock show on the planet and features the world’s only carload and pen cattle show. This annual event has been held annually every January at the National Western Complex in Denver since 1906, when several visionary agriculturalists realized the need to hold an annual stock show to demonstrate better breeding and feeding techniques to area stockmen. The National Western Stock Show kick-off parade is a sight to see. On this January afternoon, people sport boots, chaps and cowboy hats to celebrate and go see Longhorn cattle walking through the streets of downtown Denver. It’s a step back in time and see a true western cattle drive with horses, cowboys, cowgirls, tractors, marching bands and floats. The National Western Rodeo is nationally recognized as one of the largest indoor rodeos, and has won honors from the Professional Rodeo Cowboy’s Association (PRCA), including multiple ‘Indoor Rodeo of the Year’ titles. The Horse Shows are among the largest in the world with around 20,000 entries each year including; Quarter Horses, Paint Horses, Hunters & Jumpers, FUSE Open Horse Shows, Mules Shows and the Draft Horse Show & Pull. Proceeds from the National Western Stock Show go to the National Western Scholarship Trust. The Trust awards 64 scholarships annually to students studying agriculture and medicine to practice in rural areas at colleges and universities in Colorado and Wyoming. Victory parades date back to the Roman Empire, where military conquests were celebrated. Today, it’s the winning sports team who host a victory parade in their hometown. In 1996, the Colorado Avalanche became the first time a team from sports crazy Denver to win a world championship, after they rallied from a 3-2 deficit to defeat the New Jersey Devils 3-1 in Game 7. About 500,000 people attended the 17th Street. victory parade. “I was expecting it to be crowded and nice, but when you’re actually in it and the cup’s right next to you, everything kind of comes together, everything you’ve worked for and dreamed about,” recalled all-star Ray Bourque, who won his first Stanley Cup with the Avalanche. Roars echoed off office buildings, dozens of people crowded onto a balcony above the start of the parade, and others leaned from windows to catch Adam Foote pumping his fist at the crowd. Some grabbed for white pompons Avalanche coach Bob Hartley threw from the top of a fire engine. A blast of daytime fireworks capped the afternoon parade that had fire engines carrying the Stanley Cup and the team through downtown. After the Avalanche peaked, Denver’s football legends the Broncos started their Super Bowl stampede. In 1998, an estimated 650,000 fans gathered in downtown Denver for a victory parade and rally after the Broncos defeated the Green Bay Packers. The parade followed a route along 17th street, from Wynkoop to Broadway, and then along Broadway for several blocks before working its way to the rally on the steps of the Denver City and County Building. Broncos owner Pat Bowlen, head coach Mike Shanahan, quarterback John Elway, running back Terrell Davis, Colorado Governor Roy Romer and Denver Mayor Wellington Webb congratulated the sea of Broncos fans. Elway and Davis were honored with street signs bearing their names. Then it happened again. Back-to-back the Broncos won the Super Bowl in 1999 when the Broncos bucked off the Atlanta Falcons, winning 34-19. The parade was awesome, but what became historically noteworthy about this victory was not the parade, but the increased celebration violence among fans. Not so much on game day, but after the Super Bowl, fans turned over cars and benches, lit bonfires and broke windows. The police had to use tear gas to disperse crowds. There were 20 arrests and damage was estimated at $160,000, including broken windows at historic Brown Palace and trash dumpsters set on fire. It was far quieter on parade day as 375,000 fans lined the parade route and milled around Civic Center Park awaiting the arrival of the team, who had arrived at Denver International Airport just two hours before their victory parade and rally. team’s third Super Bowl title under the ownership of Pat Bowlen, the crowning achievement of a Broncos defense for the ages and the last dance for beloved quarterback Peyton Manning. By the time the noon parade launched from Union Station, fans had packed themselves dozens deep along 17th Street, where a procession of 22 firetrucks, five flatbeds and a variety of other vehicles rolled to Broadway, where it turned toward Civic Center for a massive rally with minimal issues. Police reported only one arrest. 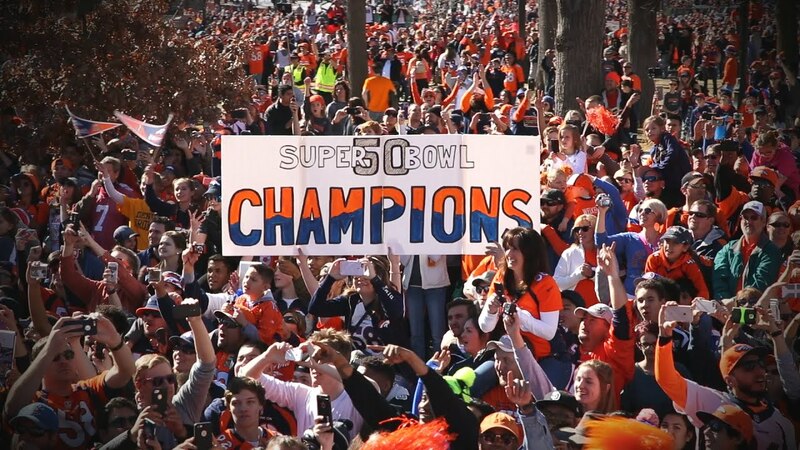 Indeed, since the Wall Street of the Rockies was inlaid at your feet along 17th Street in 1998 the March On medallion has become obsolete, omitting the Denver Broncos Super Bowl Victory Parades of 1999 and 2016…as well as all the other Denver team celebrations that are to come. What is the earliest parade on record in Denver? When and why did Memorial Day become a holiday? How did the Veteran’s Day holiday begin? How did Christmas lights get invented? What is the objective of the National Western Stock Show?